Giovanni Falcone was an Italian prosecuting magistrate who spent most of his working life trying to overthrow the power of the Mafia in Sicily. A distinguished career, culminating in the famous Maxi Trial was cut short when he was killed by the Cosa Nostra. 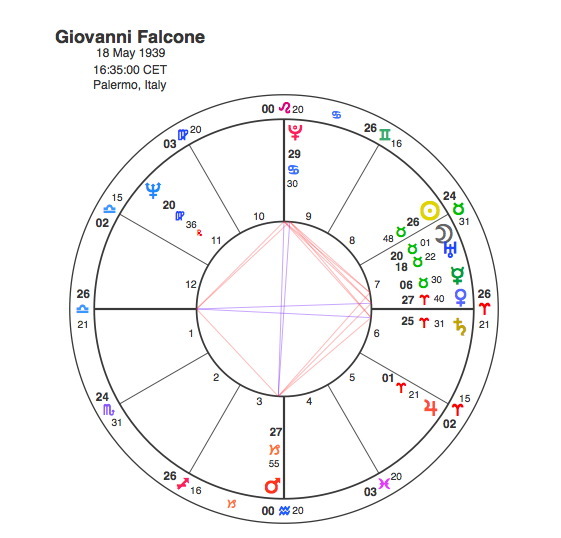 The first thing to note from Falcone’s chart is the conjunction of the Sun and Moon on either side of the 8th house cusp. The second thing to think about is Pluto’s elevated position conjunct his 10th house of career. The Sun and Moon are conjunct Uranus in Taurus. This is a particularly determined and strong willed combination, it shows someone who will not be deterred from his own path easily. So the constant threat of death did not stop him working to bring mafiosi to justice. Pluto is part of an extremely tight and difficult Grand Cross aspect pattern. Pluto is closely opposite Mars, and this opposition is square another one from the Ascendant to a Venus / Saturn conjunction. The Mars / Pluto opposition is the most violent single aspect in astrology and in this chart clearly represents the mafia. Mars is at the very base of the chart and it is in Capricorn which always has a clear structure, so underground organised crime it is then. Falcone’s Ascendant in Libra ( the scales of justice ) and its opposition to its own ruler Venus in the 7th house, shows his own position as a lawyer. Venus’ conjunction with Saturn shows both his position of authority but also the powerful opposition that his role would create and the troubles that it would bring in his life. The Grand Cross is an extremely stressful and difficult pattern to deal with because there are 4 planets or points all pulling in totally different directions. People with this aspect constantly find themselves challenged by external forces and often have very little room or time to rest. Falcone’s story is contained within a 12 year period and it will come as no surprise to regular readers that this was all mapped out by Pluto’s transits. The first stage was when Pluto triggered the Grand Cross as it came to conjunct Falcone’s Ascendant opposing his Venus / Saturn and in square to Mars between 1981 and 84. Falcone joined the investigative branch of the Prosecution Office of Palermo. He started to work at a particularly tense moment. Judge Cesare Terranova, the main prosecutor of the Mafia in the 1960s, was to have headed this office, but he was killed in September 1979. In July 1979, Boris Giuliano, who was investigating heroin trafficking by the Mafia had been assassinated and in May 1980, Giuliano’s successor Emanuele Basile, was killed. The prosecuting judge Gaetano Costa signed 55 arrest warrants against the heroin-trafficking network and appointed Falcone to investigate the case, one of the biggest Antimafia operations in more than a decade. Costa signed the indictments after virtually all of the other prosecutors in his office had declined to do so – a fact that cost him his life as he was murdered in August 1980. Falcone seized bank records to follow “the money trail” and started to work with the U.S. Justice Department which would result in “some of the biggest international law enforcement operations in history” such as the Pizza Connection. At the end of 1981, he finalized the Spatola case for trial, which enabled the prosecution to win 74 convictions, based on Falcone’s “web of solid evidence, bank and travel records, seized heroin shipments, fingerprint and handwriting analyses, wiretapped conversations and firsthand testimony” that proved that “Sicily had replaced France as the principal gateway for refining and exporting heroin to the United States”. A law to create a new offence of Mafia conspiracy, and confiscate Mafia assets was introduced by Pio La Torre but he was murdered in April 1982. In May the Italian government sent Carlo Alberto Dalla Chiesa, a general of the Italian Carabinieri, to Sicily with orders to crush the Mafia but he was gunned down in the city centre, his young wife by his side. In 1986, with Pluto opposite his Mercury Falcone led the prosecution for the Maxi trial, which began 10 February 1986, and ended on 16 December 1987 during which 360 mafiosi were convicted of serious crimes. Falcone’s killing had been ordered for some time but was suspended while the Maxi trial verdicts went through the appeals process that had often set convicted Mafia members free in the past but the convictions were upheld by the Supreme Court in January 1992. Giovanni Falcone, his wife Francesca Morvillo and police officers Rocco Dicillo, Antonio Montinaro and Vito Schifani were killed in May 1992. A half-ton of explosives was placed in a culvert under the motorway and detonated by remote control. The explosion was so powerful that it registered on local earthquake monitors. The circumstances of Falcone’s death fit very well with the Mars / Pluto opposition in his chart. His car was driving ( Mars ) to the airport to fly to his new offices in Rome ( Pluto in the 10th ). The explosive device ( Pluto ) was placed under the motorway ( Mars at the base of the chart ). Pluto was opposite Falcone’s Moon and his 8th house cusp in 1992. The man who detonated the bomb was Italian mafia boss, Giovanni Brusca who at one time stated that he had committed between 100 and 200 murders but was unable to remember the exact number. It’s important not to be fooled by the Sun in Pisces and Libra rising as this chart has one of the nastiest aspect patterns imaginable. The Sun is in very close opposition to Pluto and the powerful tensions created by this aspect are focused onto an apex Moon in Scorpio. A Scorpio Moon is capable of descending to the very depths of human behaviour and an apex planet is always expressed strongly in the person’s life with considerable force. This pattern is extremely ruthless. Nothing better demonstrated his ruthlessness than the kidnapping and murder of 11-year-old Giuseppe Di Matteo. The boy’s father, Santo Di Matteo, took part in the Falcone killing and, following his arrest, named others involved in the plot. Brusca had the boy kidnapped, and tortured him sending grisly photos to his father in an attempt to force him to retract his testimony. He was finally strangled. There are lots of connections between the charts of Falcone and his killer, Brusca. Their Ascendants are within 3 degrees of each other in Libra so they had Pluto transits at roughly the same time. In 1982 with Pluto on his Ascendant, Brusca was captured and convicted for the first time and sentenced to a year in prison. 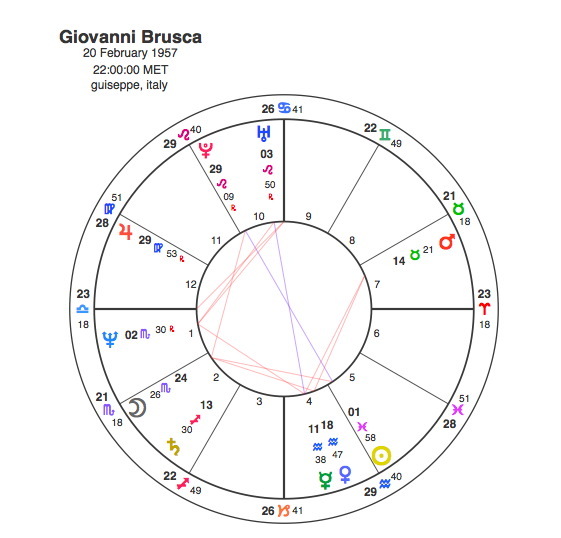 The really powerful connection is the opposition between Brusca’s apex Scorpio Moon and Falcone’s Sun / Moon / 8th house cusp. So the object of Brusca’s violence would be Falcone’s death. When he killed Falcone in 1992, Pluto was conjunct Brusca’s Scorpio Moon. This was the end for Falcone but not quite for Brusca. He was involved in the campaign of terror in 1993 against the state to get them to back off in their crackdown against the Mafia. There were a series of bombings against several tourist spots on the Italian mainland. He was finally arrested in 1996 and sentenced to life imprisonment. In 1996, Pluto was square his Sun. A film, ” Excellent Cadavers ” was made of Giovanni’s Falcone’s life and death at the hand of Brusca, but anyone not wishing to watch the grisly details should just ponder their charts instead. That’s scary enough.